Take a trip to the solar capital of Europe. Come visit Freiburg Germany where the green movement came of age. Learn how the development of feed-in tariff (FIT) laws created by those who came out of the environmental movement transforms the sensible choice of renewable energy into a good investment. The trailer video below provides a brief introduction to the documentary. First we are introduced to the background of how Freiburg became the solar capital of Europe as a city planner takes us through the recent history that lead to this development. We are shown how wine growers and farmers, along with students protested against nuclear power (in the wake of Chernobyl) and won. Then the transformation started. People figured out ways to make renewable energy work by trying different things, experimenting and learning. 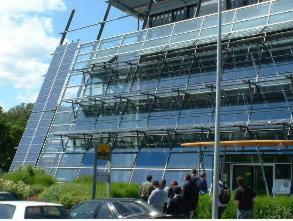 Now Freiburg is a leader in the development of renewable energy through the solar institute that resides in the city. We also learn how the green movement developed in this area and eventually led to the green energy laws and feed-in tariff that have transformed Germany into a renewable energy leader. Next we meet Andreas Delleske who will give us a tour of the 20 unit passive solar apartment building he built with co-owners. This stunningly simple and yet beautiful building shows how we can reduce energy demand in buildings by 90%. Incorporated into the building are a large solar PV array that generates electricity, a massive solar thermal water heating system, and a green roof. Also included are passive solar design for natural heating a cooling without any mechanical energy required. Finally, we learn from Andreas how they implemented an alternative waste water treatment system that closes the loop on resource depetion while generating energy (from biogas) and providing fertilizer to local farmers. Finally, we are introduced to a community wind farm development as well as a zero emissions factor that produces solar panels without any net carbon emissions. The future is here. All we need to do now is learn from these solar pioneers and a clean green future will be ours. Discover the solar capital of Europe. In this chapter you will be introduced to a municipal project manager in Freiburg Germany. Learn some of the historical turning points, critical elements for driving change. Be inspired by the useful tools that we can all use to drive the economic system towards one that is sustainable. Freiburg Germany can't teach us everything but they can provide some ideas and resources. The history of Freiburg goes back to the middle ages and some connections could be drawn from this. In the 1970's there was plans to set up a new nuclear power station not far from Freiburg. This caused widespread resistance from the population including farmers, wine growers and students. This protest prevented the nuclear power plant from being built. And then it started. Resistance against one form of energy is one thing. And then you start looking for alternatives. People began to ask where could you find alternative sources of energy. Solar for example. This was thirty years ago and someone had the idea that if you welded or soldered some copper pipes you might produce hot water. It didn't take long a people realized that even though this solar thing was a niche thing there was potential for economic development in this thing of the future. Shortly after the nuclear power plant debate the institute of solar energy systems was set up in Freiburg. It was rediculed at the time but it is now the largest institute of this kind with more than 600 people. Grassroots or bottom up is the best description of how the transformation of the community started. This doesn't mean that the majority supported it in the beginning but this lead to the sense of success in this in the majority of the community. The start of the Green movement came out of Freiburg. Essentially Freiburg was the birth place of the major environmental movement. In 1992 Freiburg was designated the environmental capital of Europe. 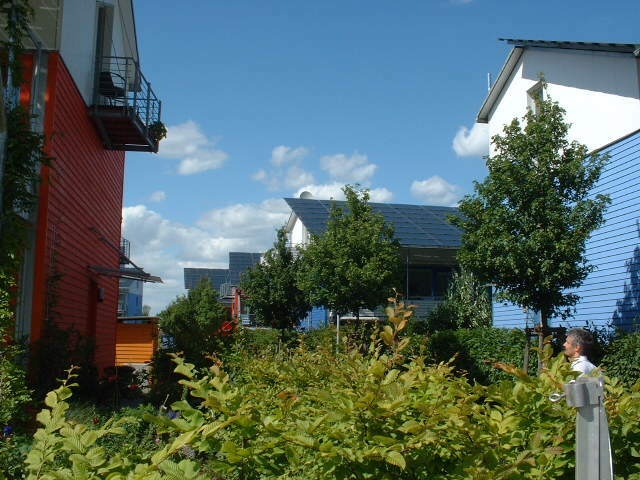 Freiburg is now rated number one in solar installations. This gets noticed by the wider public. They then start participating. In this is a nucleus for identity with this new and special idea. People are then able to connect their own identity to this solar thing. The hardest thing is always money. Solar is one of the most expensive forms of energy. You have to raise funds for this. The enthusiam of individuals then becomes important. For example the solar panels on the soccer pitch in Freiburg was financed by allowing citizens to buy shares of the installation. Each citizen then became small scale electricity producers. It being in such a renowned location allowed people to see their electricity production. This type of joint ownership scheme has now been widely replicated throughout the world. As necessary preconditions of success you have to have reasonable costs (10% is something people are prepared to pay), things must be comfortable and fit with the lifestyle, and finally control is required so that people feel like they have security. For more information about John Wilson, the producer of this web site and documentary video, contact him at www.NaturalLifeNetwork.com or wilsonjd9@hotmail.com . Much more than simple shading systems, good windows and mass in the flooring systems, the passive solar home in this chapter also has solar hot water, solar photo voltaic, and cogenerating power systems. This large scale apartment/condominium building has twenty comfortable and modern units. Comfort is superior while the annual utility bill is almost zero. Andreas Delleske is a member of a private group that built a "passive house" that uses only 1.5 litres of oil per square meter per year for heating. An architect and a biologist worked together to combine alternative energy and alternative waste management concepts. They found friends who were also interested and involved in energy topics. In the end sixteen members decided to build the home together in 1997. The house is composed of twenty units. The price overall of the building was only 7% higher than conventional new built homes. The house has a higher value since the residents pay very little for energy to heat the home. The entire structure required, which includes twenty units, each unit having about 90 square metres, and the annual utility bill was only 140 euros. Often people pay ten times this amount annually. By building with a group there are also savings in terms of sales and marketing costs. Internal gains from appliances, people and other internal sources. Humans produce 100 watts to contribute heat to the house. Unoccupied the home would require twice the amount of heating energy required. Solar thermal collectors of 46 square meters that produce 60% of hot water required. 3 kWh photo voltaic solar array for electricity generation that produces about 10% the requirement. Cogeneration plant that, operated with natural gas, which produces 60% of the electricity required by the house and 100% of the remaining heating requirements. The low flush is required for the biogas plant that can process the remaining waste to produce electricity and heat. The primary reason for the alternative sanitory system is to close the loop on waste even though this process also produces energy. Farmers will use the waste material to fertilize their fields while the biogas is used for energy generation. The energy problem is significant but the sun is available to solve this problem. Behind the energy problem is the resource limits which requires that we close all waste cycles. The greenroof ensures that only 10% of the rain water goes into the drainage system. Ninety five percent of all wind power is privately financed in Germany. Find out why this is such a brilliant investment in the future. Each wind turbine in the wind park near Freiburg cost 2 million Euros. Six of these 1.8 MWh wind turbines were installed at a cost of 13 million Euros. Out of this total individuals invested in a share of the operating company in order to provide 4.6 million in capital. Five hundred and twenty people invested a minimum of 3,000 Euros. Each 3,000 Euros generates 12,000 kWh. Each investor gets money back over twenty years from2003 to 2023. Over this time each investor gets 280% of their money back. To start with each investor gets 3% in the first year, then 5% the next year until in the last year the investor gets 20%. The tower is 98 metres height. On the top is is the 100 tonne generator. The tower was made of concrete since it is too difficult to bring steel up the mountain. The concrete tower was constructed over about three weeks. Unlike the first generation of wind turbines this new generation has no gear. The blades turn 22 times per minute transforming DC to AC. 95% of German wind turbines are privately financed. People invest because they get money back. The federal subsidy makes it a good investment. Normal electricity has a once cent per kilowatt additional cost added so that wind and other renewable's can be purchased at a premium. Wind gets paid a couple cents more than conventional power. Solar gets paid many times more. Visiting this state-of-the-art zero emissions solar panel manufacturing plant shows how we can transform not just the homes we live in but also commercial buildings and factories. Zero emissions are possible today. Solar Fabrik built their zero emissions factor with the aim of demonstrating what they will expect of others in the future. Wise use of energy, water, air, and materials plus carbon dioxide neutral production. They've shown it can be done and it is a huge employee motivator and a source of fascination for visitors, suppliers and customers. As a producer of environmentally friendly technology it goes without saying that Solar Fabrik takes full advantage of renewable energy sources. Over five hundred square meters of solar panels on the south side produce limitless solar power. A carefully thought out energy concept. The building faces south towards the sun. In winter when the sun is low the sunlight reaches deep within the building helping to heat it. In the summer when the sun is high the solar modules and glass facade shade the building and keep it cool. The solar architecture is enhanced by a special ventilation system. Fresh air blows into the building through underground ducts. The soil has a constant temperature of about 12 degrees celsius. The cool fresh air is pre-heated in the winter. The flow of hot air in the summer is cooled. The factory it supplied exclusively with renewable energy. Solar energy enhances the quality of life. Using solar energy doesn't mean doing without. Using solar energy means we can carry on as normal without depleting resources for future generations.